One of the things I’ve always liked about the Reader’s Digest was the quick, memorable way stories were presented. 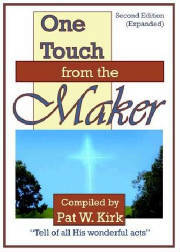 Pat Kirk’s compilation of stories in One Touch From The Maker does the same thing. 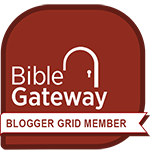 Over 30 stories — many of them told first person — tell about the miracles of God showing up in both ordinary and extraordinary situations. You’ll find stories about broken families and loving families; civilians and military personnel; young and old; urban, suburban, and country; national and international; land and sea; distant past and recent occurrence. In short, there’s enough evidence in these stories to bolster anyone’s faith that God sees our needs and God touches us at the point of our need. These are not highly-polished, professionally-written stories. They are real people writing about their real experiences. They are stories we can all relate to. My thanks to Pat Kirk for looking me up on Twitter and sending a review copy my way.